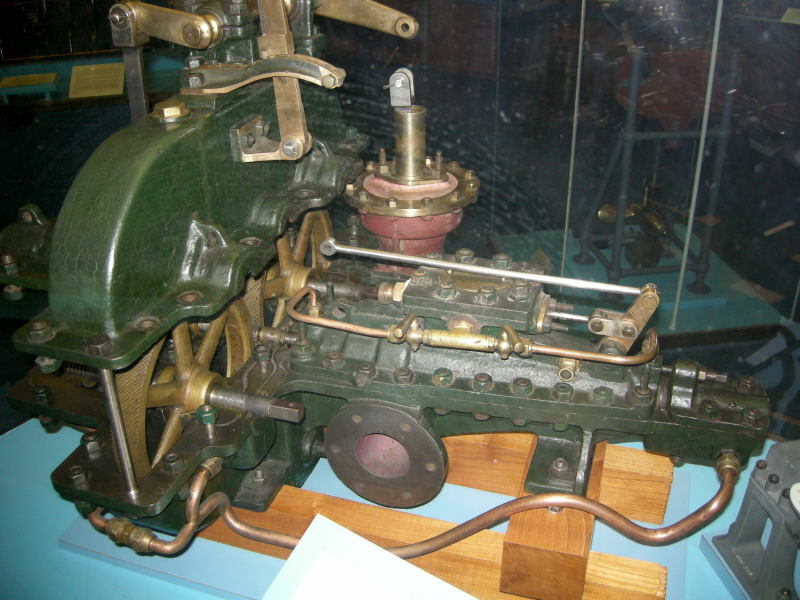 The first geared steam turbine for marine propulsion, on display at the London Science Museum. Made in 1898 for F. Buddle Atkinson's 22ft. launch 'Charmian'. 10 HP, 1400 rpm propeller speed, 1:14 reduction gearing. The reversing turbine blading was on the same shaft as the ahead blading. 1900. Turbines for the destroyer Viper. 1931. Geared Exhaust Turbine Set for SS Kingswood. 1931. 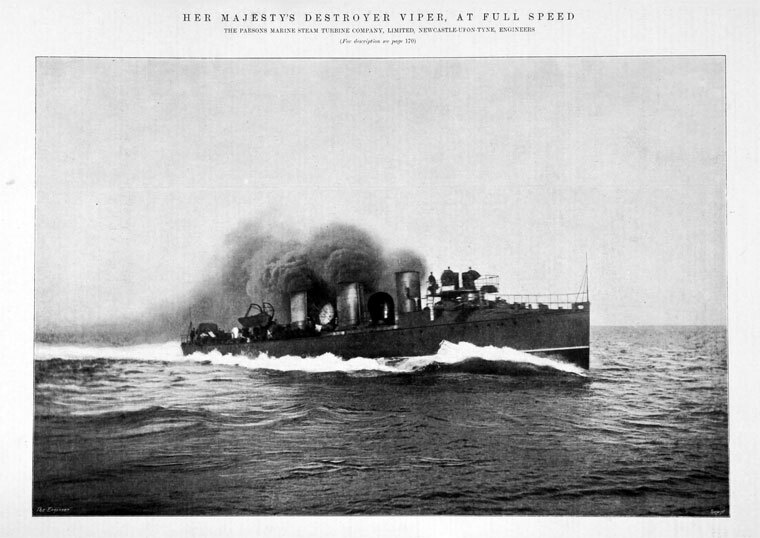 H.M.Destroyer Acheron. Standard Turbine Unit. 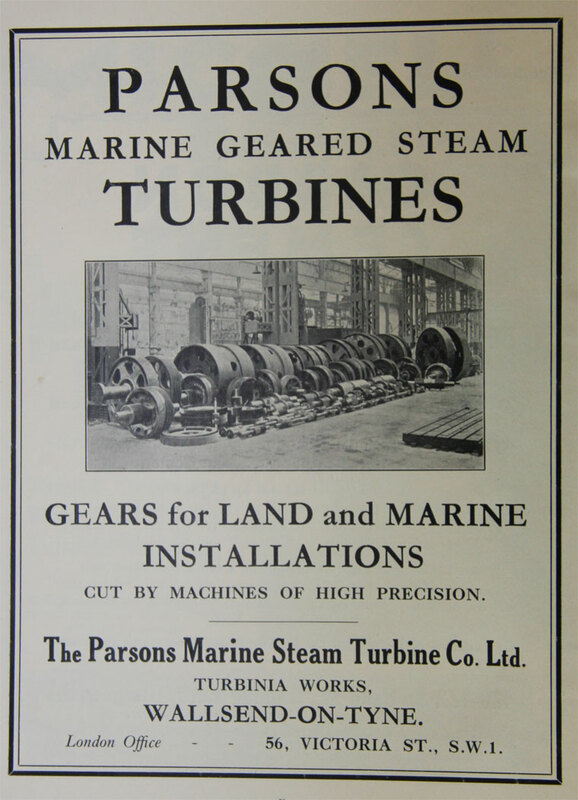 Parsons Marine Steam Turbine Company of Turbinia Works, Wallsend, often referred to simply as Parsons, was a marine engineering company which was founded in 1897 by Charles Algernon Parsons. 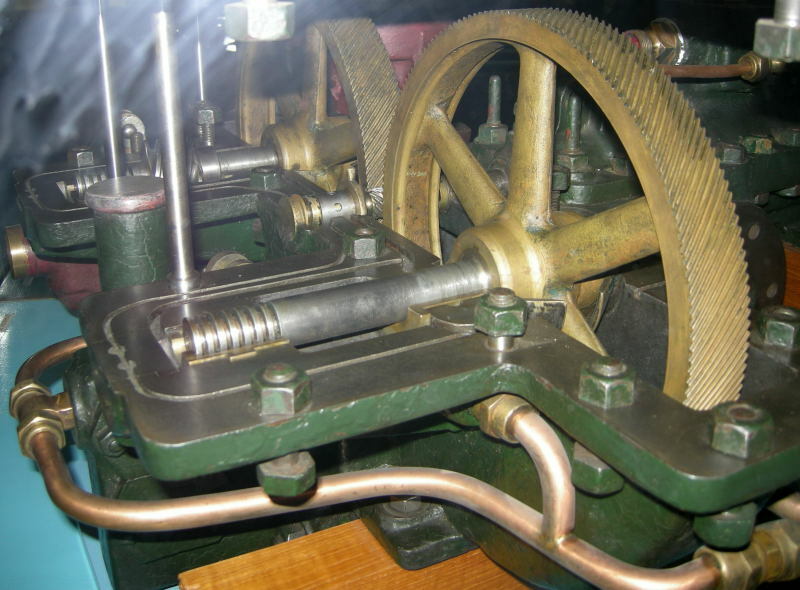 It specialised in building the steam turbine engine that Parsons had invented based on his patent of 1884 which is said to be comparable in importance to that of James Watt in 1769. 1894 Parsons applied for a patent for 'propelling a vessel by means of a steam turbine, which turbine actuates the propeller or paddle shaft directly or through gearing'. 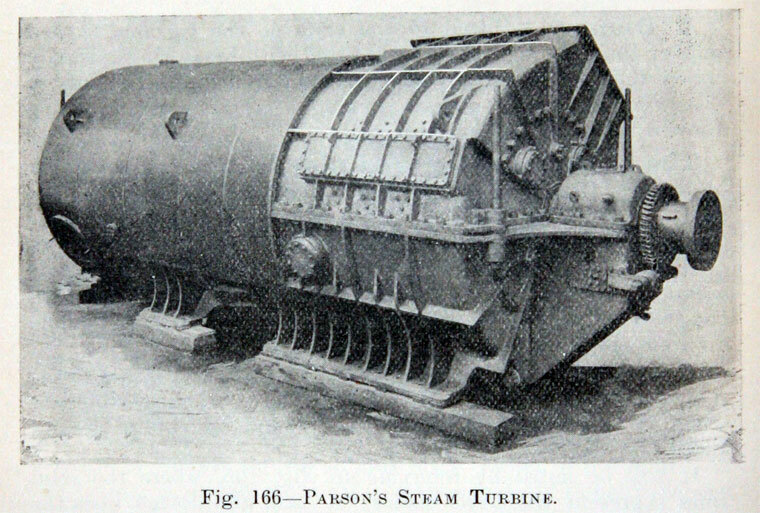 1894 Parsons formed the Marine Steam Turbine Co to exploit the marine applications of his turbine and to construct the Turbinia. 1897 Turbinia was sailed at speed through the Diamond Jubilee fleet review of the Royal Navy in June 1897 off Portsmouth, demonstrating the great potential of the new technology. Today, Turbinia is housed in a purpose-built gallery at the Discovery Museum, Newcastle. 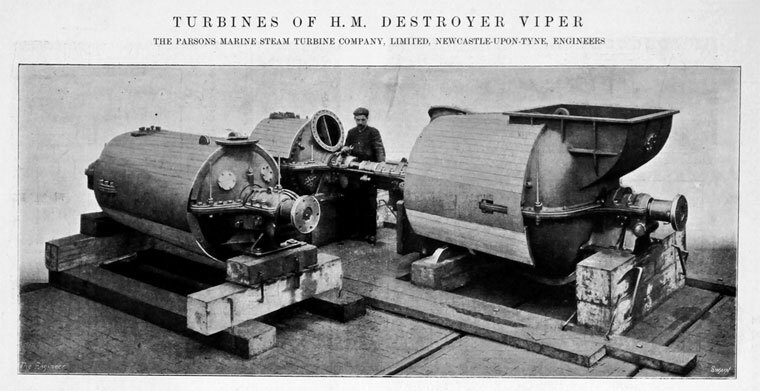 1897 After the success of the Turbinia, Parsons established the Parsons Marine Steam Turbine Co with £500,000 of capital to acquire the assets and licences of the Marine Steam Turbine Co.
1900 HMS Viper, the first turbine powered-destroyer to be tested, was built by Hawthorn Leslie and Co and demonstrated by the Royal Navy off Porstmouth, averaging 31.1 knots over 6 runs at 2/3 maximum power. H.M.S Cobra would have been the first such vessel but had been damaged at the construction dock which delayed her trials. During the next few years a variety of other vessesls were built with turbine propulsion. 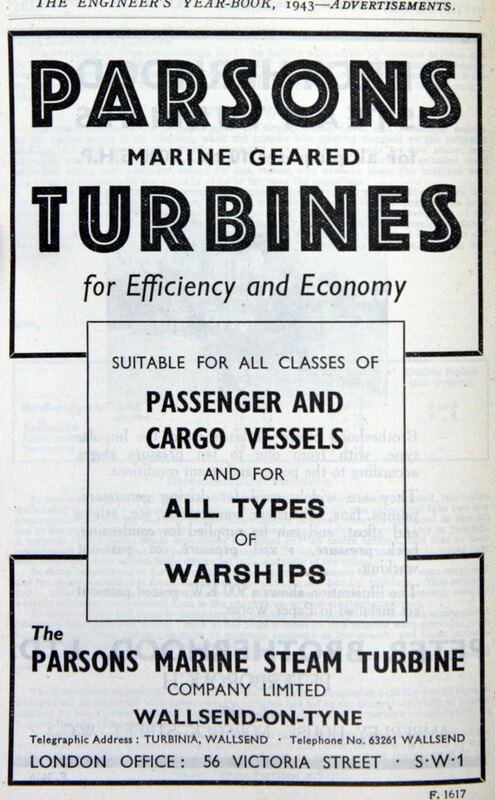 1907 Advert by Hawthorn Leslie and Co for turbine-powered vessels, the turbines manufactured under licence from Parsons Marine Steam Turbine Co. Parsons also constructed turbines for the battleships Dreadnought and St Vincent. 1910 Considerable expansion of Turbinia Works at Wallsend had taken place in the past 4 years; the waterfrontage was 800 feet and ground area of 23 acres; much up-to-date machinery was in use. 3,600,000 h.p. of Parsons marine turbines had been or were being completed in the U.K. and other countries. All the leading engineering and shipbuilding companies in the U.K. had taken licences to build Parsons turbines. 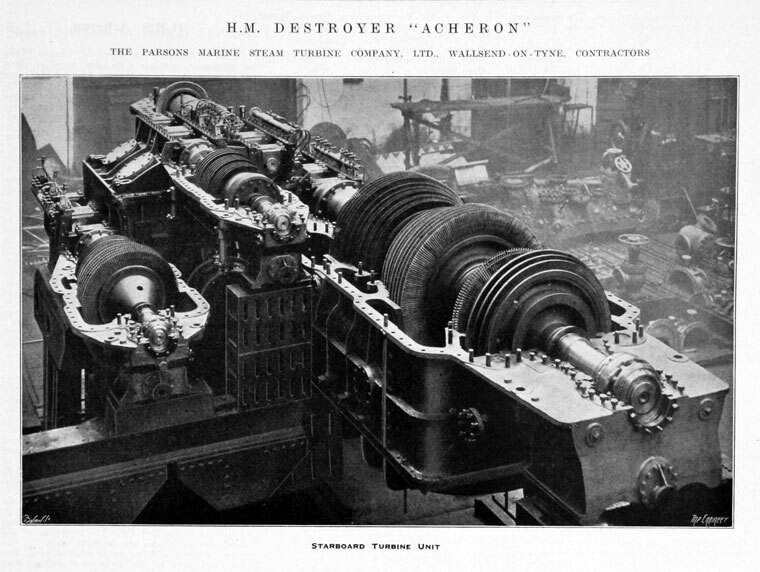 1913 Helical gears used in conjunction with marine propulsion turbines had been produced for some time by the Power Plant Co Ltd for Parsons Marine Steam Turbine Co. David Rowan and Co and several shipbuilding companies also were considering taking licences from Parsons to make such gears. 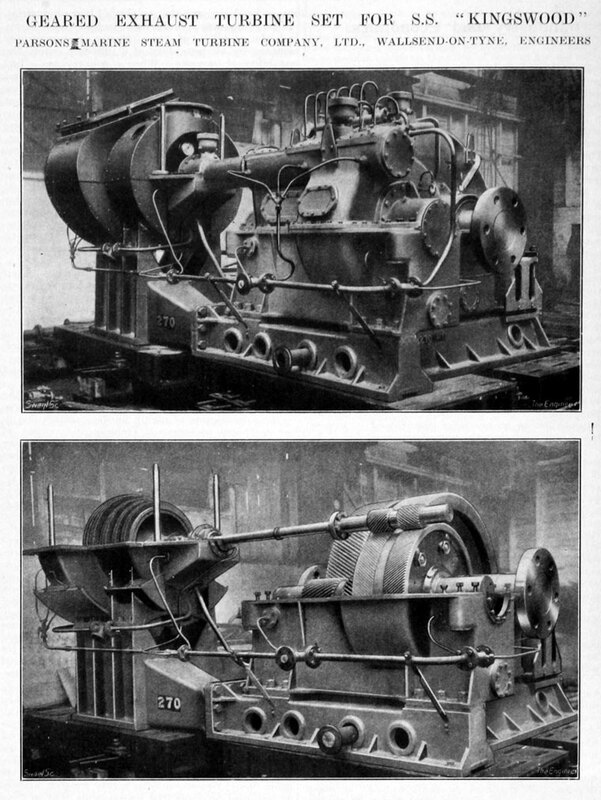 William Muir and Co of Manchester had received orders from 4 companies for gear cutting machinery. 1923 (January) Parsons set up Cleveland Shipbuilding Co to acquire the shipbuilding yard of Sir Raylton Dixon and Co and the adjoining yard of William Harkess and Sons; Parsons had a controlling interest in the new company. 1926 H.M.S. Suffolk was launched, the first post-war cruiser; Parsons supplied the machinery. 1928 The aft-part and the turbine engine of the Turbinia were presented to the London Science Museum, there being insufficient space for the whole vessel. The original turbine (which had been replaced) was also part of the gift. 1931 Death of Sir Charles Parsons. 1934 Parsons announced the development of the Simplex engine, producing c.2000 shaft h.p., suitable for small cargo vessels, the first time this had been done. 1936 Launch of 2 destroyers ordered from Parsons, the hulls being sub-contracted to Vickers-Armstrongs Ltd, an arrangement used quite often for new constructions. 1938 Capitalization of reserves, the first time the issued share capital of the company had been changed since it was formed, required special measures because some of the shares were not fully paid-up. 1944 A new research and development organisation was formed by 19 shipbuilding and marine engineering companies; its name would be Parsons and Marine Engineering Turbine Research and Development Association (PAMETRADA). 1956 Acquired by Richardsons, Westgarth and Co. This page was last edited on 8 March 2017, at 00:09.